The act requires that the firm’s promoters file a certificate of limited partnershipThe document filed with the appropriate state authority that, when approved, marks the legal existence of the limited partnership. with the secretary of state; if they do not, or if the certificate is substantially defective, a general partnership is created. The certificate must be signed by all general partners. It must include the name of the limited partnership (which must include the words limited partnership so the world knows there are owners of the firm who are not liable beyond their contribution) and the names and business addresses of the general partners. If there are any changes in the general partners, the certificate must be amended. The general partner may be, and often is, a corporation. Having a general partner be a corporation achieves the goal of limited liability for everyone, but it is somewhat of a “clunky” arrangement. That problem is obviated in the limited liability company, discussed in Section 20.2 "Limited Liability Companies". Here is an example of a limited partnership operating agreement: http://www.wyopa.com/Articles%20of%20limited%20partnership.htm. However, see Section 20.3.3 "Limited Liability Limited Partnerships" for how this “control rule” has been abolished under ULPA-2001. General partners owe fiduciary duties to other general partners, the firm, and the limited partners; limited partners who do not exercise control do not owe fiduciary duties. See Figure 20.1 "The Limited Partnership under ULPA-1985". The general partners are liable as in a general partnership, and they have the same fiduciary duty and duty of care as partners in a general partnership. However, see the discussion in Section 20.3.3 "Limited Liability Limited Partnerships" of the newest type of LP, the limited liability limited partnership (triple LP), where the general partner is also afforded limited liability under ULPA-2001. 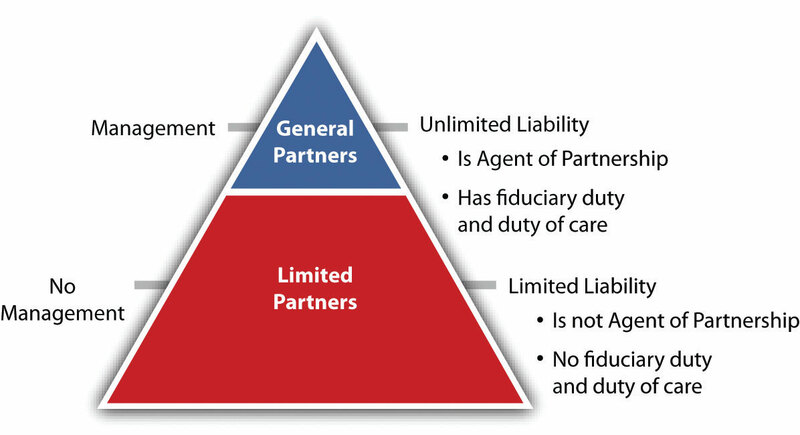 The limited partners are only liable up to the amount of their capital contribution, provided the surname of the limited partner does not appear in the partnership name (unless his name is coincidentally the same as that of one of the general partners whose name does appear) and provided the limited partner does not participate in control of the firm. See Section 20.4.1 "Limited Partnerships: Limited Partners’ Liability for Managing Limited Partnership" for a case that highlights liability issues for partners. We have been discussing ULPA-1985 here. But in a world of limited liability companies, limited liability partnerships, and limited liability limited partnerships, “the control rule has become an anachronism”; ULPA-2001 “provides a full, status-based liability shield for each limited partner, ‘even if the limited partner participates in the management and control of the limited partnership.’ULPA-2001, Section 303. The section thus eliminates the so-called control rule with respect to personal liability for entity obligations and brings limited partners into parity with LLC members, LLP partners and corporate shareholders.”Official Comment to Uniform Limited Partnership Act 2001, Section 303. And as will be noted in Section 20.3.3 "Limited Liability Limited Partnerships" under ULPA-2001 the general partner is also shielded from liability.